Earlier this week Cooking with Mickey had an opportunity to chat with actor Bruce Boxleitner about his participation in this year's D23 Expo. Boxleitner, one of Hollywood’s enduring leading men, starred as Alan Bradley/Tron in the 1982 original film TRON, reprised his role in the 2010 sequel, Tron: Legacy, and voiced the main character in the video game, Tron: Evolution, which released alongside the movie sequel. He is currently providing his voice for the character of Tron in the upcoming animated series Tron: Uprising. Known to sci-fi fans worldwide, Boxleitner also starred in the hit TV series, Babylon 5, as well as having a four-year run opposite Kate Jackson in Scarecrow and Mrs. King. Cooking with Mickey: With all of your work on westerns and sci-fi it seems you pioneered the concept of "Cowboys Versus Aliens." 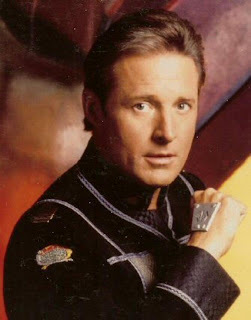 Bruce Boxleitner: Yes I was. That movie seems very familiar (laughs). I actually wrote a novel in 1998 Frontier Earth while I was working on Babylon 5. It was about an alien visit during the 1880's. I've always been into those genres and it was something I wanted to write about since I had a very core audience. Cooking with Mickey: Were you surprised at the success at TRON and how it continues to fascinate audiences? Bruce Boxleitner: It was a total surprise. TRON has been a gift that keeps on giving. At the time the movie did well but it never reached that blockbuster success. That year was quite a time for science fiction films and heavily influenced the films of today. When rumors surfaced about a possible sequel I dismissed it since I always tried to look forward. However when I saw the Comic-con clip on YouTube I was excited to see this coming back and that Disney was working on it. Looking back on it now I'm very proud of our work and how it ushered in the world we live in today. The original TRON looked like Donkey Kong in compassion, however the world has evolved and looks amazing. No other science fiction world looked quite like that original world. Cooking with Mickey: We're looking forward to Tron: Uprising! Bruce Boxleitner: We are getting close to finishing up the first season that should be airing in January. Cooking with Mickey: What are your thoughts of working with Disney on the Tron franchise? Bruce Boxleitner: In my mind Disney was the place to take Tron, Disney IS animation and the home of magic. Both directors of the films were very tech savvy and were pioneers in the realm of CGI. I look forward to Tron: Uprising and Disney XD's twist on they type of animation that was in Tron: Legacy. I'm amazed at the whole motion-capture thing as well. Cooking with Mickey: That looked amazing! Bruce Boxleitner: I was pleased with the result. This was all new to me. The characters were supposed to be programs, not quite human. I wished I had that body when I did the original Tron (laughs)! It really looks a lot like the videogames we play today. Cooking with Mickey: Are you a gamer? Bruce Boxleitner: No, not at all (laughs). In fact I'm working on a new Special Ops 5 game now. The videogame voice acting is just trying to give life to those characters, much like Tron: Legacy. Cooking with Mickey: I loved seeing you in Babylon 5 as well as Heroes. What types of roles do you like playing, heroes or villains. Bruce Boxleitner: If it's a good role I'd like to play it. I tried to give John Sheridan (Babylon 5) some quirks and some faults to make him more human. He was temperamental and impulsive but yet sensitive and at times rough. In Heroes the character was duplicitous in nature. 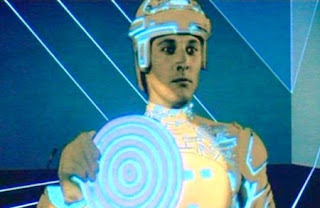 I remember after Tron I was compared to Buster Crab or something out of Flash Gordon. That wasn't bad in my opinion. Cooking with Mickey: Were you always a fan of science fiction? Bruce Boxleitner: I remember the Disney movie Twenty Thousand Leagues Under the Sea and the book by Jules Verne being one I enjoyed. I think the science fiction and fantasy genre gives actors more acting skills to grow and stretch. I believe Babylon 5 is some of the best work I've ever done. I enjoy working on Tron and Tron: Uprising. On Saturday (8/20/11) The D23 Expo will feature cast members from both “Tron” films. From the original TRON, Bruce Boxleitner (TRON himself) will be signing from 11 – 1pm only. Also appearing will be Cindy Morgan (Yori) and Jackson Bostwick (Lead Sentry Guard) will be signing from 10 – 4pm. From the new Tron: Legacy Anis Cheurfa (Rinzler) and Rob Daly (Lead Sentry Guard) will be appearing and signing from 10-4pm as well. Don't forget to listen to our interview with Bruce Boxleitner on the WDW Tiki Room show on Sorcerer Radio this Friday at 8 a.m./eastern on www.SRSounds.com! Read the press release. This interview is made possible by CookingwithMickey.info and JediMouseketeer.blogspot.com. Disney fans who can't attend this year's Disney D23 Expo can experience it from the comfort of their computer monitors. Sorcerer Radio's Kristen and Aljon, hosts of the WDW Tiki Room show will be offering live coverage of all the news and press events providing fans unrivaled access to this epic event. They will also have Sorcerer Radio giveaways as well so please feel free to say hello. The network’s live coverage of the D23 Expo begins June 19 and continues through June 21. There is also a live stream of the Sorcerer Radio Network's WDW After Dark from the convention center as well.